We note, and share, your government’s commitment to the ‘fundamental British values’ of democracy, the rule of law, individual liberty and mutual respect and tolerance. They are values which enable the work we do, as artists, film-makers, performers and writers. They are also values which we request you to take into account in your relationship with the UK’s close allies, especially, in this context, Israel. For some time, in denial of the right of free speech and publication, and in a territory that international law regards as illegally occupied, Israel’s army has taken action against Palestinian journalists. Amira Hass, in Ha’aretz, documented last year a rising tide of violence directed by state institutions against Palestinian journalists. 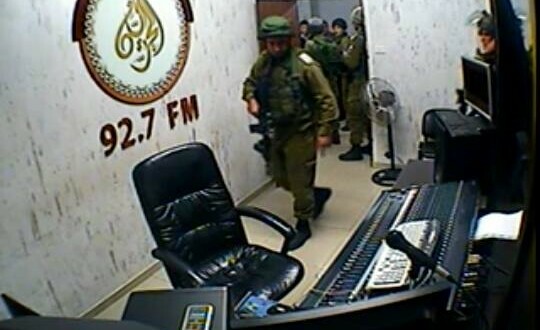 Last November, Israeli soldiers broke into the headquarters of Al-Hurriyya Media Network, vandalised offices, and confiscated equipment. Now the International Federation of Journalists (11th March) reports that Israeli forces have closed West Bank Ramallah-based TV station Palestine Today and arrested its manager, along with 2 media professionals. These actions are part of a more general pattern, in which the ‘fundamental values’ to which your government adheres are flouted in many ways. In its occupation of Palestinian territories, Israel does not abide by the rule of law; nor does it adhere to elementary principles of democracy, such as enabling free elections; and through the use of arbitrary powers of arrest, physical punishment and detention, it curtails individual liberty. In these conditions the ‘mutual respect and tolerance’ which you celebrate cannot thrive. The claim made by the Israeli government, that it is acting against organisations that ‘incite violence’, does not stand up well, in a context where for nearly fifty years, it has itself relied on coercive violence to sustain its occupation. We urge you, as a sign that you regard these violent practices as incompatible with the values of your government, to call on the Israeli government to reopen the TV station and drop any charges against its workers. We request that you impress upon the Israeli government the importance of protecting the exercise of fundamental rights pertaining to freedom of speech.